This New Flushing System 20L Water Tank Outdoor Portable Toilet lets you go when you gotta go! The 20L Portable Toilet Bag makes transporting your camping toilet easy. 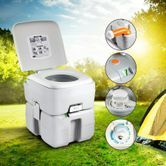 Light and durable this portable restroom is completely self-contained and comes equipped with a 12L fresh water tank that provides up to 50 flushes. It also features 20L waste storage tank that easily detaches to make emptying it easy. The double sealed drain valve prevents leaks and odours. Great for camping, hunting, music festivals and a range of other outdoor activities this camping combination of is an essential accessory for when nature calls. this item is great got it for when we have partys . it will save queuing up.fantastic.